DeatschWerks Fuel Injector Electrical Connectors UNIVERSAL - Lightning Motorsports - Selling Speed since 1996 ! DeatschWerks offers several different types of connectors because everyone has a preference as to what types of connectors they use when upgrading their injectors. DW offers double-sided plug-and- play connectors – the easiest to use since they plug right in, re-pin connectors to make your system look like stock with no soldering, and pigtails that can be soldered into your existing system. 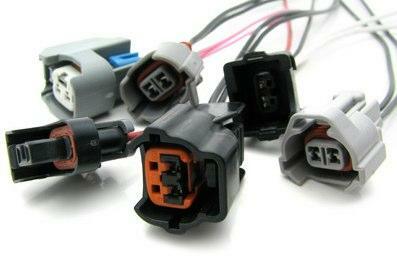 Whether you need USCAR, Sumitomo, Delphi, Honda, Jetronic, Side Feed connectors, we have them.